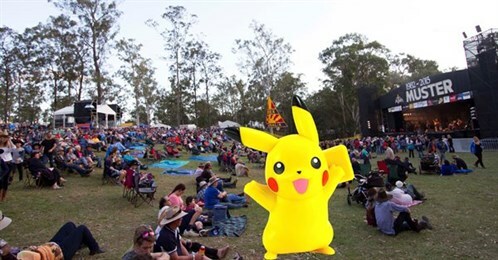 Music lovers will still be able to chase Pokemons like Pikachus and Jigglypuffs around the festival grounds at Amamoor Creek State Forest, Qld, and won’t have to suffer without access to social media thanks to several Wifi vans which will be onsite to boost the internet connection. With high-speed internet capability, festival organisers have also launched a dedicated Muster app and innovative and rechargeable RFID wristbands which will make the Muster a ‘cashless’ experience. The expected 12,000 festival-goers will be able to ‘top up’ their wristbands at top-up stations within the grounds and use them to buy food and drinks, theoretically reducing the long waiting queues which traditionally plague music festival outlets. “We’re constantly in search of ways to make the Muster experience a little bit more enjoyable for our Muster Mates and bring down the barrier of logistics so everyone can really just enjoy the artists and the atmosphere we create, and not be burdened by drink tickets and all of those bottlenecks,” Muster executive director David Gibson said. The wristbands also eliminate the worry about carrying or losing valuables at a music festival. Unused funds can be refunded during festival hours or collected upon departure. The Muster app will provide a wealth of information for visitors including maps, performance schedules, artist profiles, music, news, weather and FAQs. Click here to buy tickets to the Gympie Music Muster.